With just five more episodes to go, before the two-hour series finale on May 13, DESPERATE HOUSEWIVES continues to go strong, with ever character’s story moving forward, or even ending. 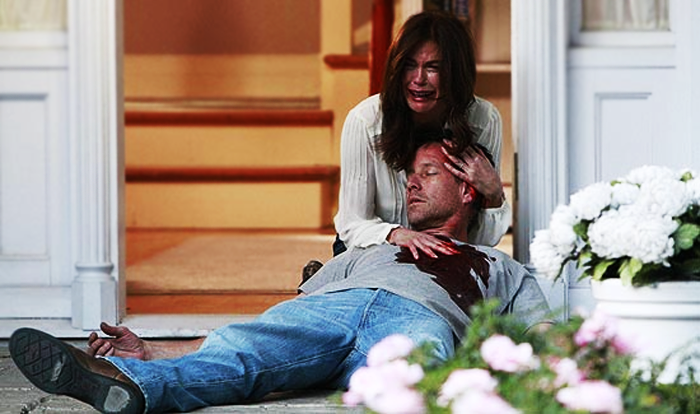 Yes, one of the most beloved characters of the show, Mike Delfino was shot in the chest at the door of his and Susan’s home, after almost eight seasons of him being such a constant on the show. As I watched him fall, after pushing Susan to safety, with the heartbreaking montage of their moments together since they met in the pilot, I knew that a very essential element of the show’s foundation had been shaken. I won’t deny that Mike’s character hasn’t had all that much of a role in the last couple of seasons, with him being fit into storylines that primarily involved others. However, he was an essential part of one of the protagonist’s (Susan’s) story all along, right from the pilot, when she told him not to eat her mac-and-cheese at Mary-Alice’s funeral and he was an integral part of the very first mystery on the Lane—Mary-Alice’s suicide. Since then, Mike and Susan’s relationship has been a complete and total rollercoaster: The initial awkward phase, his secrets and her lies, Susan competing with Edie, his accident and amnesia, their first marriage, a baby, his prescription drug addiction, their divorce, his relationship with Katherine, their second marriage, their financial problems, the return of Paul Young and Zach into their lives, him helping her deal with covering up a crime, his involvement with Ben and Renée’s problems, and finally, his murder. They have been the ‘it’ couple on the show, like Meredith and Derek in GREY’S ANATOMY, or even Ross and Rachel in FRIENDS. And if there was anyone, whose death on the Lane would shake everyone, it had to be Mike. I figured that it would have to be him, considering that killing off others like Renée, Ben, Carlos, Tom, or even Karen McKlusky wouldn’t have made as much of an impact. If it had been Carlos or Tom, it could’ve come close to Mike’s death, but it wouldn’t have served any purpose to the progression of the story, since both Carlos and Tom have their own stories going on at this point, especially Tom. In fact, when it was announced, a long time ago, that a main character would be killed, I had guessed that it would be one of the husbands, and unfortunately, Mike seemed to be the perfect candidate. Having said that, I do still maintain that his death came as quite a shock to me. With the chilling final montage before he hit the ground on being shot, and the haunting music that played in the background, I knew that things would never be the same again. Susan has an all new hurdle to overcome—dealing with the loss of her husband; being a single mother again, to her son this time; and preparing to be a grandmother. At the same time, we know that Mike’s death will have Renée feeling immensely guilty, and it will also make other residents of Wisteria Lane put things into perspective. 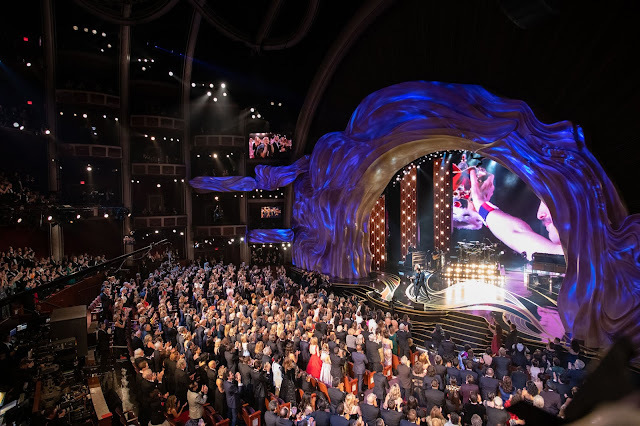 Besides, with this new development, end seems nearer than ever, with other recent developments like the return of Karen McKlusky’s cancer and Renée’s openness about a future with Ben. Yet, it seems like the next five episodes will continue to be action-packed, with Orson having revealed to the police all that can implicate Bree in the murder of Gaby’s stepfather, with Tom planning a future with Jane, with Carlos’ life still somewhat of a mess and with Susan and Lynette’s preparation to be grandmothers. Up until the beginning of the season, it seemed like we might just see all the housewives getting their happy endings, but now it appears that that is not the way it will end, especially with Bree and Susan nowhere close to that. However, I’m sure it will still end on a positive note, and the focus will be on the housewives’ friendships emerging stronger than ever (I even hope to see Katherine Mayfair back on the Lane). 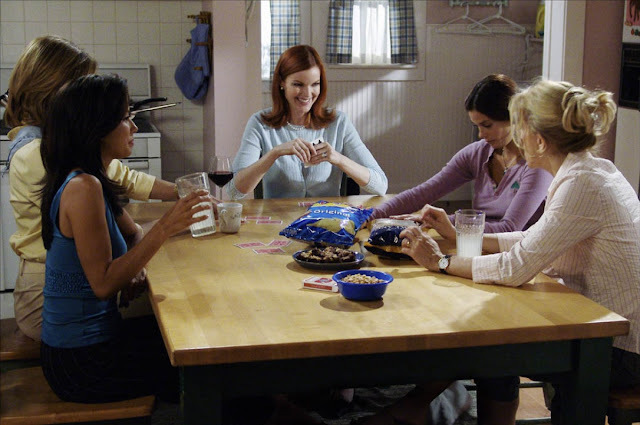 In fact, I think the last scene will have all the ladies of Wisteria Lane playing a game of poker, symbolic of how far they’ve all come, and how much they’ve grown separately and together. Yet, the last shot should be of the Lane, as it fades out to us forever. What are your thoughts on the most recent death on Wisteria Lane? It had to be Mike! For all the reasons you've mentioned in your piece. Very lovely tribute to Delfino, I say. I liked Mike! Of all the husbands around, he was the hottest. But besides that, he was also the most awesome grey character. He was a do-gooder - and that's irritating, sure. But he was also the ex-con and had an understanding of people's darkness. And in a show like Desperate Housewives, such a character is of utmost importance. Now that you mention it, Mike's death should help put things in perspective for that stupid dumbass, Tom Scavo. But there's also a part of me that hopes Lynette refuses to get back together with him. I can only imagine how this will affect Carlos. He may get sucked deeper into the whole righteousness phase he's going through. Whatever. He's annoying. PS: BTW, when are we watching the next ep? I naturally assumed it would be Karen when Mary Alice was narrating through the episode but it never struck me once that it would be Mike. By the way, I'm falling more and more in love with Bree's character. She's one of my favourites on the show currently. I realized that I haven't replied to these comments. @geetanjali A part of me has begun to think that Lynette and Tom might not get back together after all. I think it would be fine (WRT the end of my post above). We should watch beyond, soon. @Roanna It couldn't have been Karen; they built up too much about her cancer and it would've seemed very obvious, for an episode and a twist that they wanted to take us by surprise with. I was very sad too. And I'm glad you like Bree more. She's always been my favorite, since season 1.